Front Wheel Travel 124 mm / 4.9"
Rear Wheel Travel 124 mm / 4.9"
Length: 2180 mm / 85.8"
Width: 1006 mm / 39.6"
Wheelbase 1369 mm / 53.9"
Ground Clearance 150 mm / 5.9"
Seat Height 780 mm / 30.7"
Buell Ulysses XB12XT model was introduced today as the second model in the Buell Ulysses family of adventure sportbikes. 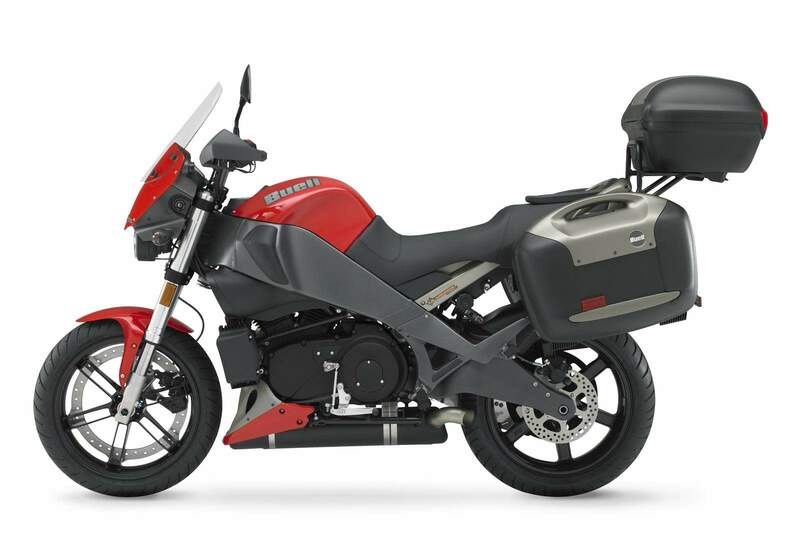 Boasting the intuitive handling and tremendous torque that Buell has come to symbolize, the XB12XT creates a stirring sport riding experience on a capable long-distance motorcycle. 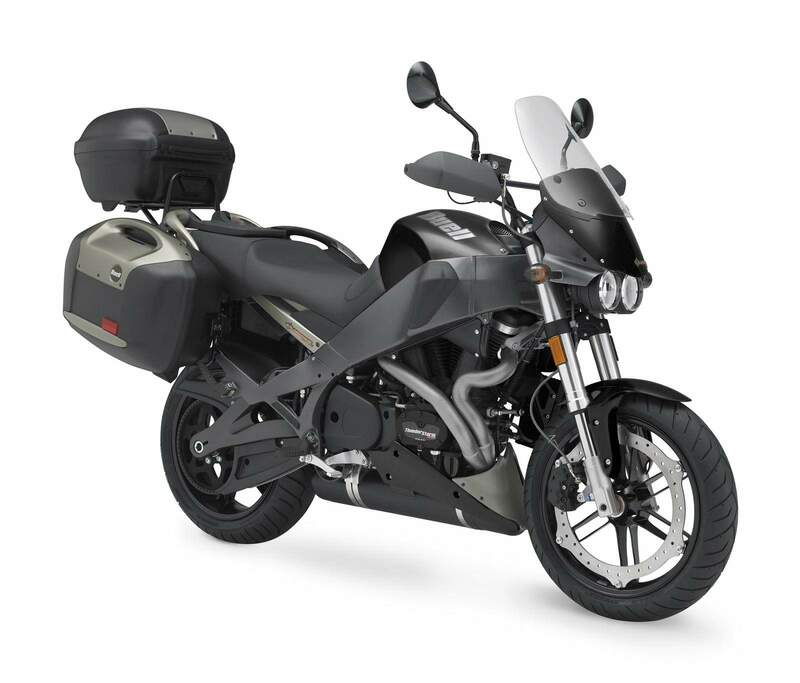 Based on the Buell Ulysses adventure sport bike, the XB12XT features a specially-tuned shorter travel suspension and lower standard seat height, standard tall windscreen, Pirelli Strada sport touring tires and standard lockable top box and side luggage cases. "The XB12XT will dish out considerable comfort and potent performance at every turn," said Erik Buell, Chairman and Chief Technical Officer at Buell Motorcycle Company. "The new suspension and many other features will let riders and passengers enjoy this motorcycle on all kinds of roads. It's the perfect bike for zipping through the city, getting out to the country and back again, or the other way around." By focusing on paved road performance, the XB12XT suspension springs and damping were optimized to soak up road imperfections, which allowed a reduced suspension travel, resulting in a lower ride height and thus a lower center of gravity. With a commanding riding position behind wide athletic handlebars, the XB12XT has a tall front screen to buffer the wind. Standard heated hand-grips warm the rider's hands in colder climates. The grips are rated at 18 watts per side on the high setting and 11 watts per side on the low setting. The XB12XT has two 10 amp/12-volt accessory power outlets (on the dash and under the seat) and an integrated helmet lock for additional convenience. The XB12XT provides the rider and passenger abundant storage space with lockable and detachable side and top luggage cases. There is also an additional storage compartment under the textured seat, while the 4.4 gallon fuel-in-frame reservoir gives the XB12XT substantial riding range. In addition to its substantial storage capacity, the Ulysses XB12XT is also ideally suited for two-up riding with a comfortable passenger seat, innovative multi-function Triple tail backrest and sturdy grab rails. The XB12XT features fully adjustable Showa suspension front and rear for ample ride comfort, agility and versatility. The 43 mm inverted front forks and rear shock with remote reservoir and dial adjust spring preload accommodate a wide range of riding styles and conditions, as well as passenger and luggage weight. A new progressive urethane bumper spreads compression forces to help absorb the rigors of uneven road conditions while the XB12XT is fully loaded. Overall suspension travel is 4.9 inches, while ground clearance is 5.9 inches with a seat height of 30.7 inches. 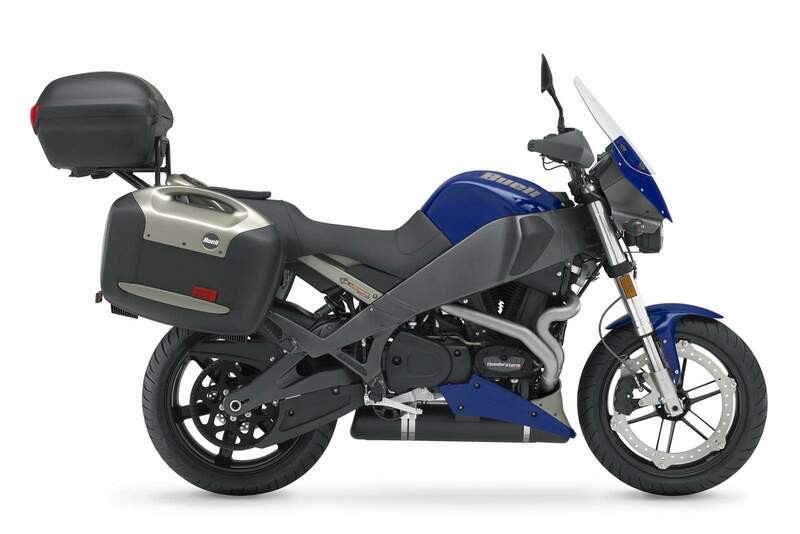 When the road is exhilarating and twisty, the XB12XT is a truly exciting sport motorcycle, propelled by a 1203 Thunderstorm V-Twin that is growling with 84 ft. lbs. of torque and delivers 103 hp of air-cooled punch. The superior handling of the XB12XT comes from Buell's Intuitive Response Chassis and a combination of patented innovations which focus on the Buell Trilogy of Technology: mass centralization, chassis rigidity and low unsprung weight. Mass centralization is achieved through innovations like carrying fuel in the frame and oil in the swing arm, as well as Buell's underslung InterActive Exhaust system. Low unsprung weight is provided by the patented Zero Torsional Load (ZTL) braking system, which transfers braking force directly to the rims allowing a lighter front wheel, while Buell's Immediate Throttle Response Goodyear Hibrex drive belt reduces unsprung weight at the rear. Reduced unsprung weight also helps the Pirelli Diablo Strada tires stay in contact with irregular road surfaces for uncompromising control.